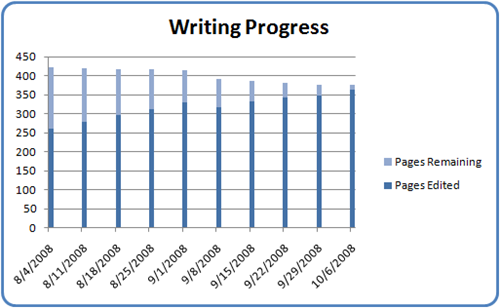 Just a quick writing update this time in which I dispense with the graphs at least for this one time. All told, this past week was not a good one for writing. I started strong, finishing off a crucial, second-to-last-chapter section, but then I got sick and everything came to a screeching halt. It was one of those "your brain now belongs to us" sort of colds that I only just got over yesterday. So, I got a little break, whether I wanted one or not. It did give me a little time to reflect on how I truly want to wrap the main storyline up. 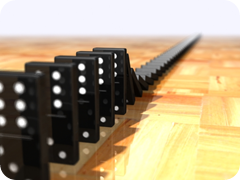 Most of it is already there, but I had made some mid-novel changes that, like a row of dominos, had ramifications all the way unto the finishing line. Those loose ends have almost been wrapped up at this point. Once that's done, I can get back to the actual writing where I will soon have this thing wrapped up. I'm closing in on the finish line. Current total pages stands at 375, down 1 page from last week. Currently editing page 362, up from last week's 348. That gives me a 15 page increase for the week, gets the pages remaining down to 13, and puts me at a bottom-line completion percentage of 96.53%. 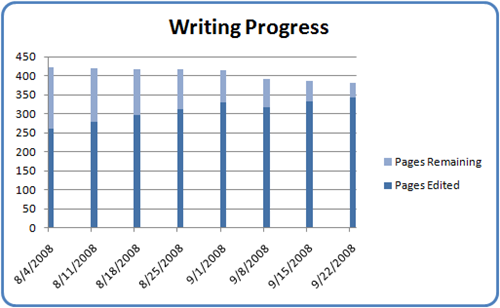 I'm happy with my progress, though I have to admit in terms of pages edited that progress seems kind of dismal. It's enough to make a less-determined person give it up. Fortunately, I think I've been doing this long enough (few years now) that I know how small the steps in writing a novel can be at times. Also, this is a first-pass edit which, for me, is really the most work (besides writing the novel itself). I might be making slow progress, but it's steady progress. With only about 1 1/2 chapters left to edit, I'm about there. Another thing I like is the total word count, which stands at 110,599, down just a little from last week, but on target for the limit I had previously investigated. More writing progress next week when I hope to announce the completion of this first-pass edit. Time for another update on my writing progress. As a quick reminder, I'm working through a first edit of a rough draft of my fantasy adventure novel, The Five Elements. Here's where I'm at: I reduced the total pages from last week's 381 to 376, and the currently edited page went up from 343 to 348. 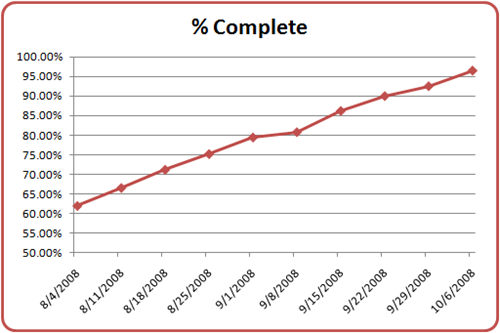 That gives me a total increase of 10 pages over last week and results in 28 pages left to go to finish. I do have to bear one thing in mind: I somewhat significantly changed, in my mind, how this story is going to end. That means as I continue to move forward fairly large pieces are getting rewritten as opposed to just making sure my grammar is correct or sentence structure is fine-tuned and polished. 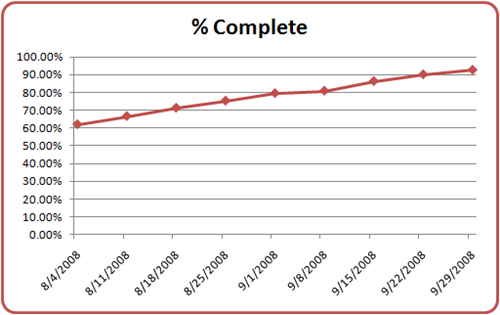 I'm at 92.5% complete with 28 pages remaining. Gotta get back to it now. Another update next week. A funny thing happened yesterday. I had begun editing chapter 22, which just so happens to be the second to last chapter in my book. Because of some scene shuffling, re-ordering, and previous edits, I had to change the way in which the chapter starts. I was really hoping for a big writing day. What I got was borderline writer's block for much of my writing time, to the point where I was sitting at my desk, staring at the computer screen, and nothing was happening. Now, I don't believe in writer's block. In my case, it wasn't even so much that I wasn't coming up with anything. It was that I wasn't coming up with what I wanted. In other words, starting the chapter wasn't the problem. The problem was that I couldn't figure out how to start it the way it needed to be started. It screamed for a very particular type of start, and I just wasn't coming up with it. So, in order to combat this, I closed my laptop and did some other things around the house: played with the dogs, treated some ant hills that had popped up after last week's rain, had some lunch. Finally, I returned to my editing, but instead of hitting the computer again I took a pen and a notepad and went outside. The weather has been beautiful out here in Texas lately, so why not? I tried different openings, free-handing it until I finally came up with what I thought was "it". I went back inside, typed it in, and started to move on, only to realize it wasn't "it". But, somewhere in that process of getting away from the computer, it finally hit me. I had it! Amazingly, the beginning of the chapter flowed from my fingers across the keyboard and onto the screen like water gushing from a spigot. It was both a defining and satisfying experience all at once. Total word count is now 111,995, down a lot from last week (114,564). That's probably the best news of all because it gets me more inline with what might be considered a saleable range. This is tempered a bit by the fact that I know I need to go back and add some more detail to one character in particular, possibly even giving him an additional scene or two of his own. 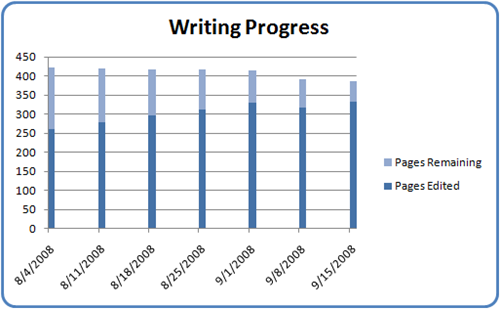 More progress next week, and I think a post discussing writer's block in more detail might be forthcoming. 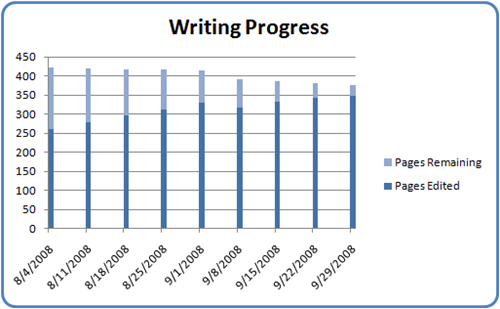 This previous week I think I hit on some nice writing progress. Overall, 22 pages closer to finishing this first pass edit. I achieved that from both sides, both increasing the current page that I'm editing from 316 to 332 but also decreasing the total page count from 391 to 385. 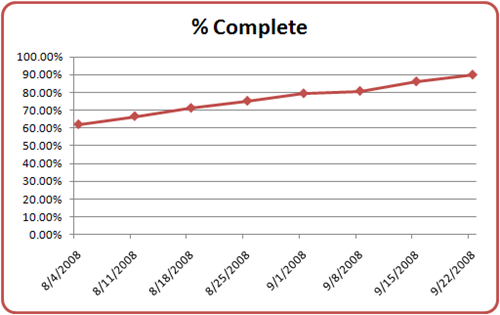 A little hard to see that the total pages came down, but the increase in the pages edited is easy enough to see. 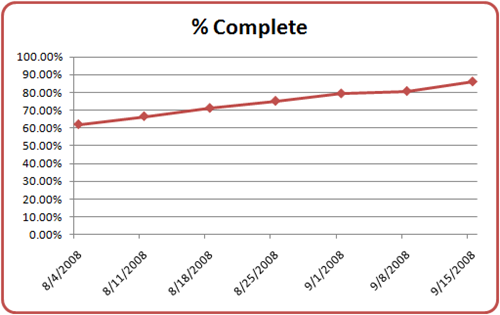 Unlike the previous week, where it very nearly flat-lined from the week before, this time there's a nice gain, putting me at a completion percentage of 86.23%. So, what changed this past week? I was more focused. I made a conscious effort to remove distractions and make some good, solid progress. I hate to think that 22 pages in one week is "good" progress, but this is something I do in addition to work, family, house, dogs, and so on. Still, I need to do more, and continue to stay focused on finishing. I'm enjoying the story immensely; it's by far better than my previous novel, both in content and style. I hope it's a sign I'm maturing as a writer and that I'm closer to getting published.